Helping to save the planet, one promotion at a time! Medium point black ink cartridge is standard, blue ink is available upon request. Made from U.S. grown renewable natural bio-polymer materials including corn, beets, potatos & tapioca. 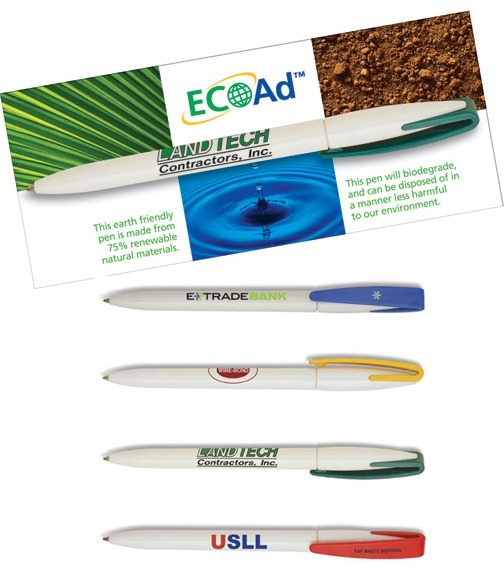 Great environmental promotion or trade show handout. Colors: Natural/Blue, Natural/yellow, Natural/Green, Natural/Red. Natural/Natural. Full color information sleeve (above) made from recycled paper included for every pen. One color, one position imprint. Standard imprint color chart. Screen charge: $35.00 per color. Exact re-order screen charge $20.00 per color. Addition color imprint add: $0.13 ea. PMS color matches $30.00 each if required. Imprint area: 1.25"W x .375"H - barrel opposite clip. Go Green On Your Next Promotion or Event!